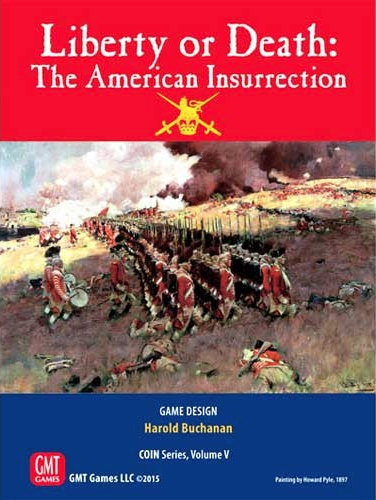 Building off the good works of COIN Series Creator Volko Ruhnke and Series Designers Jeff Grossman, Brian Train, Mark Herman, and Andrew Ruhnke Designer Harold Buchanan applies his knowledge of the American Revolutionary period to take a new look at the struggle that built a nation. COIN Series Developer Mike Bertucelli continues his work on this project and Volko Ruhnke is an active advisor. Short, medium, and long-length scenarios with period-event or random options. A 22” x 34” mounted game board. A deck of 110+ playing cards. 150+ red, green, tan, blue, and white wooden playing pieces, some embossed. 6 black and 6 white wooden pawns. 4 foldout Faction player aid sheets. 2 foldout Non-player Faction aid sheets.